Apparently, Facebook has hit a record low, in terms of active users, and is trying to veil this from the public eye by employing smart tactics. 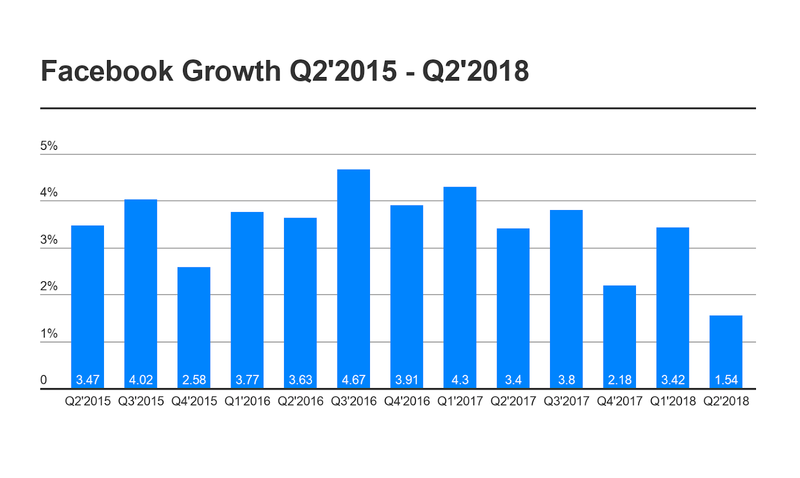 The user growth, which has always seemed to surge with every passing year, has been on a decline ever since the advent of 2018. In fact, the statistics reveal that the numbers fell so low that the price per share has decreased by a significant 20%. With these things in mind, it feels like the sharing of some data, by the platform itself, is nothing less than an attempt to divert the attention of the populations off this downward transitioning popularity rate. For the first time in the history of Facebook, Mark Zuckerberg came forward and announced that approximately 2.5 billion people used at least one of the company's applications (Messenger, Instagram and Whatsapp) in June alone. This, he said, was just the number of users and not the number of accounts registered on the platforms (one user may use multiple accounts). It was also revealed that the platform authorities were content with the statistics, as they truly represented the size of Facebook family. However, no matter what is conveyed, the fact that this is merely a trick to hide the decreasing popularity of the main application, is undeniable. The way these estimates are made, the company gets a chance to count in every user from every platform it has purchased. So even if a person has switched from using Facebook to, let's say, Instagram, this would not show in the stats, and the Facebook's decreasing following would remain hidden.